The use of discounts for all threatens your brand and profit margins. Instead, you need to look at building personalised deals and discount schemes to keep existing customers coming back for more. Hospitality is an ancient tradition, but the ways in which hospitality is shown have naturally evolved over time. For example, while in biblical times it was customary to wash the feet of visitors, nowadays we’ll probably give them the WiFi password instead. In other words, customs change – although not always as obviously as the above example. For instance, loyalty schemes have developed over the years to become more complex and more intelligent, leaving a number of venues lagging behind. Too many venues still offer generic bulk discounts to anyone who downlh2oads an electronic voucher, or clips a coupon from a magazine. These “deals” completely ignore customers as individuals – they do not accommodate tastes, habits or preferences. In an era when customers demand personalisation, the continued use of generic advertising is a waste of time and money – and could potentially cause significant long-term problems for your business. There are two distinct models of customer loyalty programs emerging – “overt” and “covert”. Overt schemes are – as the name implies – easily seen. These are generic, untargeted deals that are open to everyone: £5 off vouchers, BOGOF deals, 2 steaks and a bottle of wine for £20… The kind of deals that clog up your inbox every day. Historically, overt deals have delivered a degree of success – which is why many brands continue to use them. But your customers now expect personalised services, which means tailoring offers to their preferences and interests. There are two significant problems with the overt deal model. If these “deals” are open to everyone, they don’t feel special in any way; there is no emotional connection. The scattergun approach of overt deals means that they are often used by people who were going to visit your establishment anyway – which means that you are simply cannibalising your own income. Covert deals take a different tack, using analytics and intelligence to create offers that are tailored to the specific preferences of individual customers. Each offer is personally addressed – and restricted to “known” individuals, thereby increasing their perceived value. Your customers are used to a high degree of personalisation – indeed, most now demand it. For example, 63% of people wish brands treated them like a friend instead of a consumer. And if you can’t deliver personalisation, most will leave – 66% of consumers say they’re likely to switch brands if they feel treated like a number, not an individual. Losing two-thirds of your customer-base would be catastrophic. On the contrary, investment in customer loyalty systems pay significant dividends. One study by econsultancy found those businesses implementing personalisation saw a 14% uplift in sales. A similar report from Monetate is even more positive, pointing to an average sales upturn of 19%. At a time when margins are being eroded by the rising cost of food, minimum wage bills and new apprenticeship levies, an increase in sales is extremely welcome. The Tesco Clubcard scheme may still steal all the headlines when it comes to loyalty programs, but it’s perfectly possible to delight your customers without the same massive outlays. By doing little more than integrating your EPoS terminals with other backend systems, you can begin to generate similar insights to those created by Tesco’s Big Data behemoth. A smart EPoS platform allows you to capture and analyse valuable customer data with every transaction; what they ordered, how much it cost, and how many times they’ve visited previously. These insights form the basis of a powerful, effective loyalty program – and when deployed correctly, can be operated with a limited marketing team and budget. Collecting data allows you to build a single customer view that tells a unique story – and allows you to connect with individuals on a more meaningful level. Covert deals work because they connect on a more personal level with your customer. Whether you send them vouchers, discounts or loyalty cards, the fact that you can tailor the specifics of each to their preferences “speaks” to their needs. By using technology to understand customers, you can build a rapport with your customers and make them feel more welcome and comfortable when they visit your venues. All of which means they’re much more likely to come back – and keep spending. Overt deals are becoming less effective. Overt deals have the potential to damage your brand and offer little for building customer loyalty. Covert deals are tailored to the interests and preferences of your customers. Personalised deals are powerful motivators to bring customers back into your venue. Customer loyalty programs start with your EPoS. 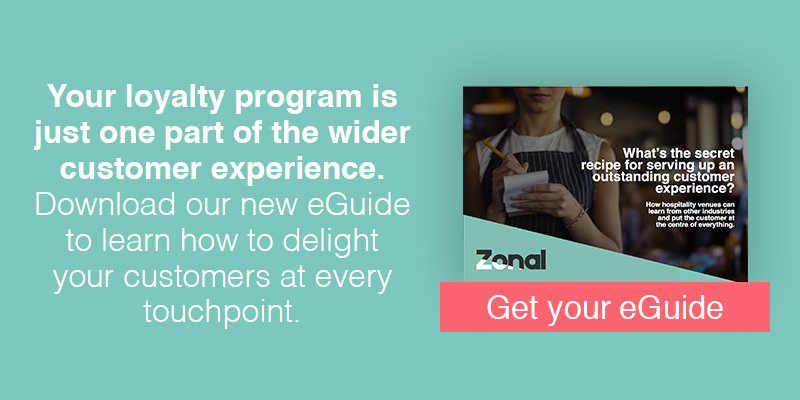 Effective customer loyalty programs do not have to be big, expensive, or heavily resourced.